← El Morocco Inn & Day Spa – 3 Night Stay – March 24, 25 & 26th – Desert Hot Springs, CA. 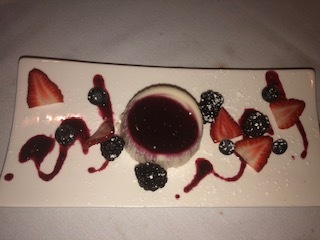 Dinner – Il Corso – March 24, 2019 – Palm Springs, CA. 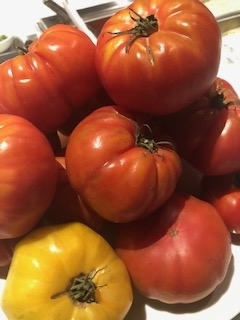 Imagine the best food in Italy; except you are in Palm Springs. 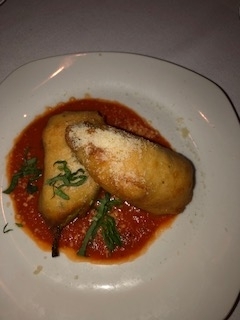 A while back I did a tasting at the Il Corso sister restaurant in Palm Desert and was very impressed. When I saw that they opened a new restaurant, I jumped at the opportunity to do a new review. The review I did a few years ago was incredibly impressive, but now it’s only gotten better. Il Corso is a much-needed addition to the gentrification of downtown Palm Springs. The hotel next-door, The Ronan by Kimpton, is elegant and gorgeous; so, Il Corso is just the perfect fit for this new upscale part of town. Il Corso takes you on a tour of Italy with dishes from Sicily to Venice. The interior is very refreshing, with a pizza oven and a huge wine wall. Everything there is a part of the whole experience and inspires one’s appetite. The bar area has its own menu, smaller plates, and some mini versions of the main courses served in the dining room. 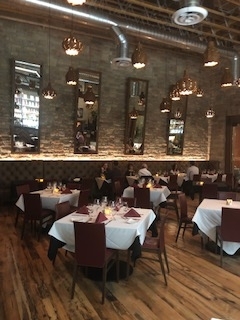 In the dining room, imported Italian, natural stone walls; reclaimed farmhouse wood on the floors and entryway ceiling; comfy red chairs, and red and white linens on wood tables. 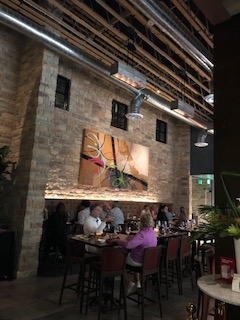 Overhead: shiny, oversized air ducts give the restaurant an industrial feel below the piano-wire taut, pattern of steel cables crisscrossing the high ceilings. The ambiance is enhanced by lighting, which is very complimentary. The bar, tucked behind the host’s desk, seats approximately 15 and beyond that, more seating. In the back is an open kitchen with counter-seating in front of the pizza oven. The counter is an immersive experience and an opportunity for chef Claudio Marfia and his diners to get to know each other. If you’re good with letting go, Marfia would be thrilled to plan your entire meal for you. He loves to do this. 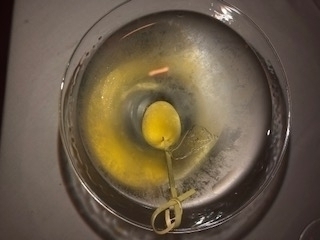 Martini Milano, Lombardia, Martini bianco, martini rosso, mint syrup, mint leaves, tonic water, shaken. A lovely effervescent cocktail, that had all of the right ingredients mixed together. Marfia Cocktail, Toscana, Belvedere vodka, tangerine belvedere vodka, Mario’s tangerine liquor, tangerine juice, granatina syrup, shaken. I thoroughly enjoyed this cocktail, and would order it often. 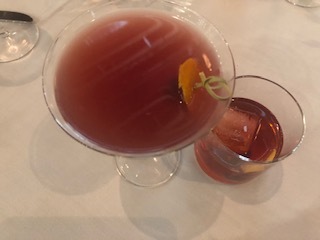 Il Corso Cocktail, Sicilia, Basil Hayden’s bourbon, cinzano, Campari, cherry, stirred. 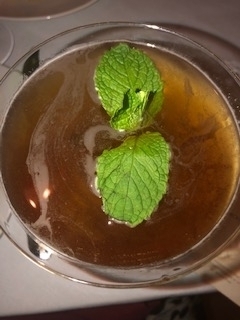 This cocktail was a bit too heady for me, very bold and strong, one of my guests loved it. 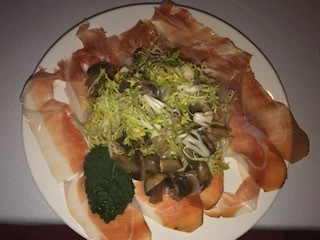 Speck Tirolese, Trentino Alto Adige, GF, champignon mushrooms, Belgian Endive, speck. The speck is sliced very thin and the mushrooms are the stars of the show, everything about this dish will inspire you. Impepata Di Cozze, Sicilia, GF, sautéed mussels in a white wine sauce. 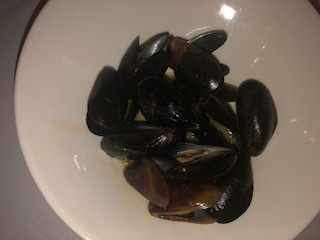 These delicate mussels were cooked to perfection with a very tantalizing broth. 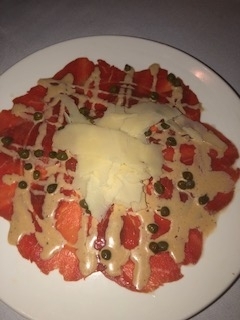 Carpaccio Di Manzo Alla Veneta, Veneto, GF, Cured beef in a harrisbar sauce topped with capers and shaved parmigiano. I have always loved Carpaccio, though some people do not like the fact that it is raw beef, when it’s cut super thin with a great sauce you just can’t go wrong. Burrata Nostra, Puglia, GF, burrata fagiolini, heirloom tomatoes. 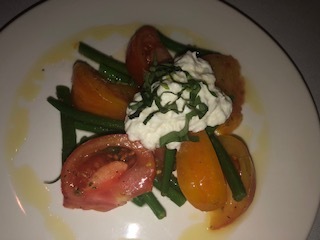 The burrata melts in your mouth, like it is supposed to, and the tomatoes sing with happiness, a no-brainer appetizer. 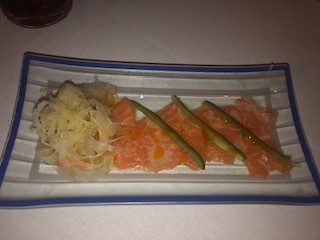 Salmone Tiradito, Puglia, cured salmon topped with light chili sauce, served with fennel salad. This was my favorite appetizer and I could eat this all day. The salmon is cured to perfection; with the fennel salad; it is a wonderland for your eyes. I just wish the ride never ended. Minestra Di Verdure, Puglia, GF, Vegetables soup with topped with toasted bread. I can always tell what a restaurant has to offer from its soups, all three were simple delightful. 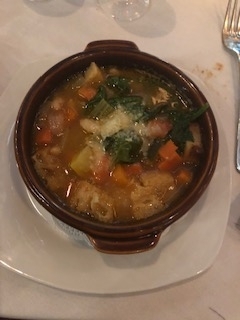 Zuppa Calurese, Sardegna, fregola, mixed fish, in a fish broth. It is served with couscous, another amazing soup, with such fresh seafood. Tortellini In Brodo, Emilia Romagna, mini veal ravioli, julienne vegetables, chicken broth, and parmigiano cheese. 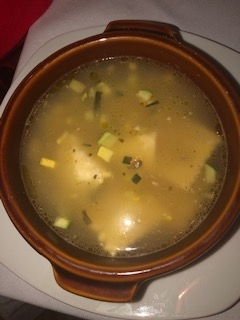 This is a very similar soup to a Jewish kreplach, it is just what the doctor ordered. Pappardelle Ai Bolognese, Toscana, pappardelle pasta with beef ragu. The pasta was so fantastic, thick, lovely handmade pasta does the trick, and the sauce is rich and bold, a great pappardelle. Fruiti Di Mare, lots of seafood with a light red sauce. Shrimp, clams, mussels, adorned this wonderful pasta, I would order this every time. Bavette All ‘Astice, Sicilia, cherry tomatoes, white wine, arugula, chopped lobster. I always love lobster and this dish did not disappoint. The sauce was amazing and the lobster was fresh and sweet, I would definitely order this again. Spigola All’Isolana Sicilia, Mediterranean Sea bass baked in the oven with tomatoes, black olives, and potato. 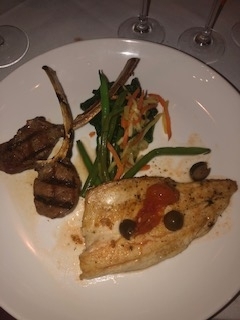 The sea bass was light and wonderful, with the olives as the backdrop, it really pops in your mouth. Scottadito D’Agnello, Lazio, Rack of lamb in a rosemary sauce, served with roasted potatoes and rapini. This lamb is succulent and tender, plus the rosemary sauce really sealed the deal for me, yum! Torta Di Cioccolato, chocolate hazelnut cake with vanilla ice cream. A beautiful desert with lovely chocolate and the ice cream was pure heaven. 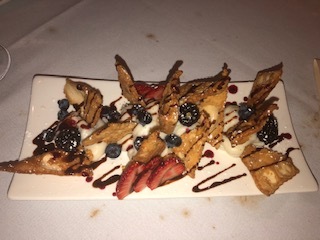 Cannoli Chips, pastry shells, sweetened Ricotta, and drizzled chocolate sauce. A very nice take on a standard desert, I would recommend this one. Panna Cotta, Italian vanilla bean custard, raspberries, strawberry sauce drizzle. This is a nice light choice, it really rounds out the whole experience. Massimo, Malvasia Istriana, Istria, this was the perfect wine for the Salmone Tiradito. Lunelli Villa Morgon Chardonnay, Trentino, a great pairing with the Spigola All’Isolana Sicilia. Tenuta Di Nozzole, Bruniche, Chardonnay, and I would do this wine with the Fruiti Di Mare. Vini Bianchi Al Bicchiere, a true Italian wine that should be paired with the Carpaccio Di Manzo Alla Veneta. Massimo, Terrano Istriano, Istria, I loved this wine with the Pappardelle Ai Bolognese. Ascheri, Barolo, Piemonte, this wine is a must-do with the lamb, Scottadito D’Agnello. Belpoggio, Rosso di Montalcino, Toscana, forget the dessert wine, pair this wine with the Torta Di Cioccolato, it enhances the rich chocolate flavors. Il Corso’s wine list is just spectacular, many can be enjoyed by the glass. Take a recommendation from the Sommelier or your wait staff, they know the wines and will not steer you in the wrong direction. Executive Chef Mario Marfia has done a great job with his skill and knowledge of all things Italian. There are such great products mixed with homemade goodness that you just want to keep coming back for more. But at the Palm Springs location his son Claudio has taken the helm. Claudio Marfia, 33, grew up in an Italian kitchen. His father, a chef from Palermo, had him “peeling potatoes and cleaning squid” since he was a tot. “It was like my day care,” he says. He came to Coachella valley was he was a teenager, but went to college and worked in Los Angeles and Europe. Once finished, he came back to the dessert to start a business with his father, “The desert always stayed with me,” he says. “We wanted our look to be like a Tuscan, upscale farmhouse but with a Los Angeles, Chicago, or New York vibe,” says chef and owner Claudio Marfia. His dad Chef Mario Marfia was born in Sicily, Italy and honed his craft working as a chef in the Mediterranean. He brings those cultural influences to the El Paseo location, partnering with developer John Wessman to create a truly unique fine dining experience. 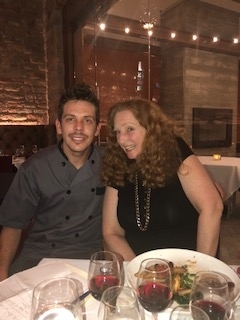 My great, sweet waitress, Reyna Barbeyto, from Texas made my culinary journey flawless. She was very competent and just delivered amazing service. Sauces are made separately at each restaurant, and that’s because the Palm Desert Il Corso is all about Tuscany. 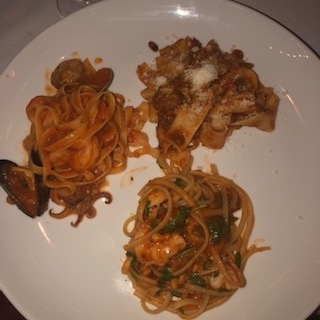 While Chef Claudio’s Palm Springs version takes you on a culinary tour of Italy, each dish is representative of a specific city or region (the menu tells you where), with regional wine pairings to complete the experience. 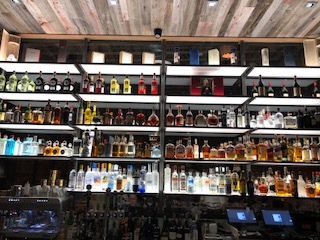 The new Palm Springs Il Corso opened in Jan 9, 2019. Owner/developer Michael Beckman was very smart to expand his successful brand in this very upcoming part of Palm Springs. Il Corso offers genuine Italian hospitality serving a wonderful variety of authentic Italian dishes – fresh salads, homemade pastas, wood oven pizza and delicious seafood. You can see many tourists as well as locals enjoying the fruit of Michael Beckman’s labor. Il Corso is a tasteful addition to the plaza outside the Kimpton Rowan Palm Springs Hotel, the entire area is a vibrant scene with shopping, and dining. Chef Marfia makes all of the bread, pasta, and pizza dough at another family restaurant, Trattoria Tiramisu. The kitchen has been expanded to include what they call “the lab” where all of the big gadgets and equipment live, including a gelato maker, which is his current favorite new toy. He and his father started out as pastry chefs, so you know why it’s all so good. Il Corso in Palm Springs offers sophisticated dining with no pretense. 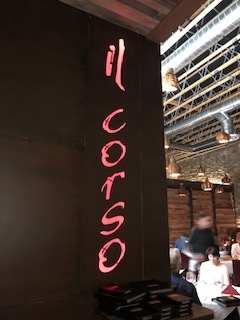 If you want the best authentic Italian food without getting on a plane, you must give Il Corso a try. *Some Content was taken off of their website.